Synopsis (from Amazon): Every woman has stories to tell about her mother. The mother that she remembers, the mother she wishes she’d had, the mother she doesn’t want to become, and then eventually, the mother she buries. Every immigrant woman has stories to tell about her homeland. My Mother’s Funeral is a combination of both: Mother and Homeland. The book circles around the death of Páramo’s mother but the landscape that emerges is not only one of personal loss and pain, but also of innocence, humor, violence and love. One (or more) Sentence Summary: My Mother's Funeral will make you laugh and cry. I absolutely loved how Carmen put her children and God before anything else. She was an amazing woman. There were so many stories within the book that reminded me of my own childhood and mother. I laughed at all the "catholic-belief" stories and know so many women just like Carmen. I like to think of it as "the good old days." I am extremely jealous that Adriana has written this book. I have written a book about my mother in my head, so many times. I would love to honor her with a book. Adriana had a very special relationship with her mother...as I did. Near the end of the book, when the family goes back to the Carmen's apartment after she has been cremated.....oh the lump in my throat. I know all my siblings and I had so many things of my mom's that we each wanted for the same and different reasons. It is so hard to lose your mother, especially when she was the only one that was there your whole life. Adriana does a beautiful job writing this memoir and honoring her entire family. Favorite Character(s): Carmen! What a strong, independent, amazing women. Fast read/slow read: Average pace....not fast, but not slow. Cover: I love the vintage look! It is perfect. Monday, January 6th: Read. Write. Repeat. Would I Read Other Books by the Author: Yes, but not on anthropology (sorry). 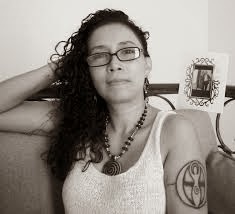 Páramo is a cultural anthropologist, writer and women’s rights advocate. Her book “Looking for Esperanza,” winner of the 2011 Social Justice and Equity Award in Creative Nonfiction (Benu Press) was one of the top ten best books by Latino authors in 2012, the best Women’s Issues Book at the 2013 International Latino Book Awards, and the recipient of a silver medal at the 2012 BOYA, Book of the Year Awards. 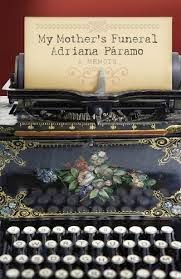 She is also the author of “My Mother’s Funeral,” a CNF work set in Colombia released in October 2013 by Cavankerry Press. I love that this book brought back good memories for you and reminded you of "the good old days."